• Make your first deposit for a 100% Bonus up to $150 FREE! • Make your second deposit for a 50% Bonus up to $200 FREE! • Make your third deposit for a 25% Bonus up to $300 FREE! • Make your fourth deposit for a 50% Bonus up to $200 FREE! • Make your fifth deposit for a 100% Bonus up to $150 FREE! All traditional casino games to play! Blackjack, slots, Roulette, (Video) Poker, Baccarat, Vegas Craps, Sic Bo, Keno, Casino War, Scratchcards. Try MegaSpin Major Millions, King Cashalot and Treasure Nile for progressive huge pots! UPDATE February 2014: Luxury Casino Player Breaks Record for Largest Mobile Win! 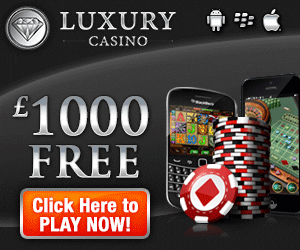 It seems that a player (the Netherlands) has won the largest mobile jackpot of USD$1,009,402 at Luxury Casino. The player had redeemed a birthday bonus and won the amazing jackpot, playing for the 1st time on his iPhone. The casino had sent me a $50 gift for my birthday, so I decided to use it to place some bets on my favorite game, 'Major Millions'. The jackpot was over a million dollars, and I was using free money, so I had nothing to lose! Two minutes later and the reels started flashing and the bells started ringing! The bonus is a gift of free cash that is added to your players account once a deposit is made. Check the Promotions page for the most up to date specials offered. Casino Rewards is a VIP program for fantastic rewards! Exclusives, gifts and bonuses are offered to loyal players. Comp points: 100 points = $1 in casino credits. Hungarian, Italian, Japanese, Korean, Norwegian, Portuguese, Russian, Chinese, Slovenian, Spanish, Swedish. Mobile languages: English, Dutch, German, Swedish, Suomi/Finnish, French, Russian. Mobile: Apple, Android or Blackberry mobile devices may access the mobile casino. Live chat * Toll free numbers * email * FAQ's. Not playable in a lot of countries: Angola, Armenia, Australia, Azerbaijan, Belgium, Benin, Bhutan, Burkina Faso, Burundi, Cape Verde, Central African Republic, Chad, Christmas Island, Cocos [Keeling] Islands, Comoros, Congo, Ethiopia, Micronesia, France, Guinea, Hong Kong, Iraq, Liberia, Libya, Malawi, Mauritania, Maldives, Mayotte, Myanmar, Niger, Norfolk Island, Rwanda, Sierra Leone, Sudan, South Africa, Syria, Uganda, Dominica, Kuala Lumpur, Kyrgyzstan, Pakistan, Pitcairn Islands, North Korea. UK, Austria, Canada, China, Cuba, Chile, Brazil, Denmark, The Netherlands, Finland, Germany, Italy, Japan, Korea, Norway, Portugal, Spain, Sweden, Greece, Russia, Turkey and still other countries. eCOGRA Certification! A 128 bit encryption (highly recommended for online transactions on the Internet) guards in protecting against any unauthorized access.